Chalk Hill Wine Bar Chocolate Cherry Finish (P/N WF578-C). The hand-finished hardwood veneer b..
Howard Miller Bar Devino Wine Bar (P/N 695-080). Americana Cherry in select hardwoods and vene..
Howard Miller Cabernet Hills Wine Bar (P/N 695-002). 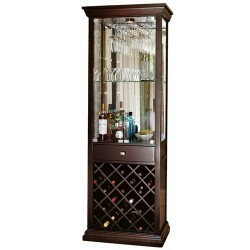 Exclusively offered with a Worn Black fin..
Howard Miller Merlot Valley Wine Bar (P/N 695-016). Distressed umber finish and worn black fin..
Howard Miller Piedmont Hide-A-Bar (P/N 690-000). Finished in distressed Rustic Cherry on selec..
Howard Miller Seneca Falls Hide-A-Bar (P/N 690-006). Finished in Americana Cherry on select ha..
Howard Miller Sonoma Hide-A-Bar (P/N 695-064). Finished in Americana Cherry on select hardwood..
Kenwood Wine Bar Chocolate Cherry (P/N WF541-D). The rich, hand-finished cherry wood veneer an..
St. Helena Hide-A-Bar Chocolate Cherry (P/N HB575-C). Beautifully-grained hardwood veneers are..
St. Helena Hide-A-Bar Light Cherry (P/N HB575-M). Beautifully-grained hardwood veneers are han..
Stateroom Bar (MF078B). Fun and functionality mingle in a vintage design sure to be the highli..